Though you don't have to, we recommend you seal the surface. 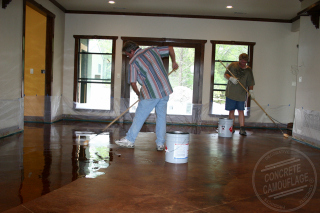 When using a water base sealer, the concrete needs to be visually dry, any concrete stain residue needs to be thoroughly neutralized and rinsed well by mopping up or washing off and it needs to be free from dirt. Do not pour the sealer directly onto the concrete. Use a paint pan. Apply the sealer with a paint roller in 2 very thin and even coats. Do not apply in straight lines, but rather more like when painting, going back and forth and in different directions, overlapping and smoothing out. Allow to dry between coats until completely clear, including in any cracks, and no longer sticky. Usually about an hour or two in warm weather and low humidity. *Use a 1/4" to 3/8" nap roller. You can allow your roller to run dry, as you are trying to stretch out the product and apply a very thin and even coat. Allow this product to cure for at least 24 to 48 hours before applying wax or traffic, 72 hours or more is recommended. It takes a full 7 days to completely cure in warmer weather and 10 to 14 days in cooler weather. Do not apply any kind of tape to freshly sealed surfaces for at least 7 to 10 days or you risk the sealer peeling when you pull up the tape, which would then have to be repaired. Minimum application temperature 45 F. Best application temps: 50 F - 90 F.
Avoid applying in extreme heat or direct hot sunlight. Avoid applying during High Humidity or if rain or fog is expected within 12 hours. Ideal Humidity 50% - 60% or less. Maximum 65%. I'm in a bind and have to get it done absolute maximum 70%. Clean up tools and spills with warm soapy water before it dries. You can apply using an airless sprayer, or spray on with a pump up sprayer and back roll any sprayer marks or heavy areas as you go. Do not allow to puddle. Avoid over applying as discoloration or cloudiness could occur. Will go on white and then dry clear. Allow to dry until completely clear and no longer sticky. Usually an hour or two. 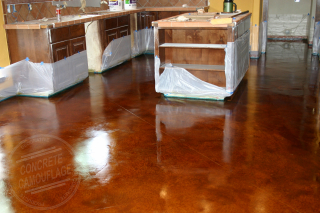 Once it is completely clear and you can walk on it, apply the second thin and even coat. Do each coat in opposite directions. Example: Go North/South on the first coat and go East/West on the second coat. You want the concrete to have an overall smooth and consistent look. If there are dry or patchy looking areas, additional coats can be done to smooth it out. The way the concrete looks after you have neutralized and rinsed it, while it is drying down, though still damp, is what it would look like if sealed with Clear Shield Decorative Concrete Water Base Sealers. Not all surfaces must be sealed if you believe they look better in their natural flat state. Examples would be statuary, retaining walls, and the exterior concrete house slab sides that are exposed. These surfaces require no maintenance. However, if you would like to seal them so as to protect them and bring out the colors more, Clear Shield has a natural satin finish. Whether Indoors or Outdoors, you can enjoy low maintenance, and scuff resistance that lasts for months by using our U.V. resistant Top Shield high traffic mop on floor wax, which is less slippery than sealer alone and comes in both Gloss and Matte Finish.